An exclamation mark at the end. Firstly, beginning with the new feature. 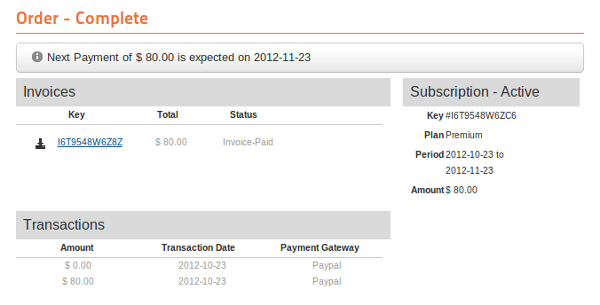 Lucidifying the things for you, we have enabled PayPlans to predict the upcoming date of payment for your customers. In case of recurring payments*, subscribers could not determine that when is the next date of payment to keep their subscription active. From now, your customers will be able to see the next date of recurring payment on their PayPlans' dashboard itself. No extra plugin is required to enable this feature. No special plan needs to be subscribed by you for this feature. No need of any sort of installation, removal, enabling or disabling. BUT, the most important thing you require to do is Subscribe PayPlans (100% open source membership software) and you are done with that. Well, this feature will be released with the stable release of PayPlans 2.2. In few days, we will be coming up with the stable release of PayPlans 2.2 and you will gain much more exciting features embedded in it. To know more about the upcoming features you can visit this blog post. *Recurring payments: Those payments which are supposed to be paid repetitively after a certain duration of time are known as recurring payments. You can assume them as paying certain amount in installments. Failure of any payment may expire your subscription of the product (Only, in case of membership softwares).